Sound A surprisingly neutral phono stage with great microdynamics and superb soundstaging; macrodynamics a bit compressed from forte on up; slight brightness and treble grain. Features Designed for higher-output cartridges; separate power supply can be upgraded; RCA inputs and outputs are not gold plated. Use Plug (in) and play; correct polarity of the power supply is essential for optimum performance; leave on at all times for most consistent sound. Value Despite its unimpressive looks, the OBH-8 delivers a lot of audiophile-approved performance; its price is inexpensive admission into the hallowed halls of high-end vinyl playback. Remember those days when a phono stage was mandatory on a preamp or integrated amplifier? When record stores actually sold records? Like Rip Van Winkle, I had a rude awakening when I bought my Jolida integrated amp a couple of years ago. Suddenly my turntable and cartridge were orphaned, unable to dock with the mother ship. After some creative financing, I was able to spring for a Creek OBH-8 phono stage to fill the void. So far, it has been money well spent. The Creek OBH-8 sure proves that good things come in small packages. The preamp is only 4"W x 2"H x 4"D. The power supply is a separate 24V DC "wall-wart" type, which uses a long cord to plug into the OBH-8. This power supply can be upgraded to improve performance. The front panel (if you can call a 2" by 4" piece of metal a panel) consists of a power switch and green LED. The back has RCA-type connectors for inputs and outputs, and connections for the ground wire and the power supply. My one quibble with these RCAs is they lack gold plating. Inside, all the components are neatly laid out on a little circuit board, with the power switch and the connectors soldered directly to it. Overall, Id say the OBH-8 is one of the least substantial-looking pieces of audio gear Ive ever seen. The OBH-8 is designed for use with moving-magnet or high-output moving-coil cartridges that have outputs ranging from 1.5mV to 5.0mV. The overall gain is 37dB. A version with more gain for low-output cartridges is available from Creek (the OBH-9). The cartridge load cant be adjusted and is set at 47k ohms and 200pF. The circuitry used in the OBH-8 is the utmost in simplicity. One low-noise bipolar transistor is used for each channel in a single-ended class-A gain stage with zero feedback. Passive equalization is used to obtain a RIAA deviation of +/-0.25%. My regular turntable is an 18-year-old belt-driven Yamaha P-350 modified with AudioQuest Turquoise interconnects, a Music Direct tonearm wrap (more about this later), and an Oracle sorbothane mat. Mounted to the tonearm is a trusty Grado 8MZ cartridge. Nordost Red Dawn interconnects linked the Creek to either a Jolida SJ202 or Anthem Integrated 2 integrated amp. Speakers used during listening sessions were ADS L620s and Thiel CS1.5s. AudioQuest Indigo speaker wire was used to connect the integrateds to the speakers. Important accessories used with my vinyl are LAST record-care products. The Power Cleaner and Record Preservative are indispensable for improving the sound of my records and keeping them in tip-top shape. None of the associated equipment is too fancy, but its all in the appropriate price range to go with the Creek. Its funny what a poor memory we have when it comes to sound. It had been over two years since Id listened to vinyl on my system. As soon as I started playing records again, I was stunned. So many of the annoying things that I had gotten used to with digital were now gone. No more funky highs! No more "stair-step" dynamics! Ah yes, now I remember -- the music! It was definitely a blast to rediscover albums that I hadnt listened to in years. But about two weeks into my trip down memory lane, I started having problems with the push-button power switch of the phono stage. It would take a few tries before I could get the OBH-8 to power up. After a couple of days of this, it failed outright. I grimly took it back to the dealership, fearing the worst. My fears were ill-founded, however, as my dealer cheerfully replaced the entire circuit board. When I sat down to listen to the resurrected Creek back in my system, something didnt sound quite right. The soundstage had collapsed and instruments sounded muddied. After a few choice expletives, I started to ponder my dilemma. It was then that I learned something important about getting the proper sound of the OBH-8. For some reason, a little voice in my head told me to try reversing the AC polarity of the power supply. (Oh no, Im channeling Enid Lumley!) This means flipping it in the socket, from hanging down to pointing upward or vice versa. After the quick switch -- shazam! The little Creek sounded like it had before the power-switch mishap. The two lessons learned? Make sure to try both AC polarities to see which gets the best sound out of the OBH-8, and leave it on all the time to avoid messing with that power switch. After allowing a couple of months for everything to become broken in, I started listening to the analog front-end critically. Most impressive were the upper octaves and microdynamics. Stringed instruments shimmered and sounded alive. Bells, triangles, and cymbals were preserved with crystalline clarity. Instruments just seemed to breathe in and out in a way that was more like the real thing. The bass, while lacking the punch of a digital front-end, was still tuneful and not at all plumy. Dynamics were sometimes startling in their abruptness. However, not everything was hunky-dory with this setup. Tonally, I found the music to be a bit on the thin side. Vocals, especially on pop recordings, tended to sound papery and thin, with a nasal quality. While the soundstage could be very wide, it lacked depth. In addition, the soundstage lacked continuity, almost seeming to consist of a patchwork quilt of instrumentalists and vocalists. Quickly realizing that the turntable and tonearm were the weak points in the chain, I was able to borrow a Rega Planar 3/RB300/Elys combo to give the Creek a fair shake. Highs took on an extra sparkle; the bass had more punch and weight. Most importantly, however, the nasal quality in the midrange that plagued the earlier front-end was gone. Now I could sense the whole person singing. The soundstage was smooth and continuous, with plenty of air between the performers. Overall, Id call it a seductively musical presentation. I couldnt keep the Rega forever, but soon after I was able to make a modification to the Yamaha with surprising results. I applied a Music Direct tonearm wrap to the Yamahas tonearm, expecting only minor improvements in sound. I was wrong. The tonearm wrap significantly opened up the soundstage and gave more body to vocalists and instruments. The upper octaves gained clarity and the midrange coloration was almost completely eliminated. Im not saying that this tonearm wrap will turn an old mass-market turntable into a high-end disc spinner, but the changes certainly made listening to my analog front more enjoyable and satisfying. After all that, youre probably wondering if Im going to discuss the sound of the Creek. Not to worry, for I have been listening to my records and taking notes. With both the Yamaha/Grado and Rega front-ends, I found the sound of the OBH-8 to lean towards the yang (bright) side of things. The high hats on Steely Dans Aja [Mobile Fidelity MFSL 1-033] are a little too splashy for my taste. I dont think that the Creek is overt in its emphasis of highs to achieve this effect. If a disc is equalized "hot" (like most pop records), then you wont be able to escape it with this preamp. However, on an old RCA shaded dog like the Reiner/CSO performance of Mahlers Fourth Symphony [RCA LSC-2364], the balance is pretty close to perfect, with a shade of added crispness to the triangles and horns. This album also demonstrates the superb tonality of this phono stage in the midrange. The strings sound full and sweet, lacking that hi-fi edginess, and woodwinds were resonant without a hint of raspiness. Vocals on The Beatles Abbey Road [Mobile Fidelity MFSL 1-023] are so smooth and velvety that the sound jars you to remember how good these guys were at getting their voices to blend. "Here Comes the Sun King" is a great example of this, as you can easily separate Pauls and Johns voices but still hear the sum total of their harmony. It makes me wish I had more of their stuff on vinyl. As I mentioned earlier in this review, the Creek does a fine job with the lower octaves. The plucked basses at the beginning of Berliotzs Symphonie Fantastique [Classic Records LSC-1900] startled me with their suddenness and clarity. Later on in the piece, during the "Death March" and "Witches Dance," the bass drums vibrate the room menacingly. As good as the bass is with my current system, however, Im sure it could be much better with a superior tonearm-turntable combination. Macrodynamics are good, but there is evidence of some compression on big orchestral fortissimos. A good example is the opening of Strausss Also Sprach Zarathustra [Mobile Fidelity MFSL 1-522]. As the CSO belts out a lusty fff at the end of the first motif, there is a feeling that the Creek is not really cutting loose like it should. This is minor because the Creek never sounds ragged or overloaded in any way. Its just that there is a bit of limiting going on from forte on up. I have a strong suspicion that the wall-wart power supply may be mostly responsible for this phenomenon. It would be very enlightening to take a take spin in the OBH-8 with the upgraded OBH-2 power supply hooked up to the drive chain. While macrodynamics are good with the Creek, microdynamics are superb. On the Pat Metheny Groups Offramp [Warner Brothers ECM-1-1216], the subtleties of Methenys guitar work stand out like never before. Metheny shades his playing by astutely varying the attacks of the notes. While Ive heard this clearly in his playing with acoustic guitar, its never been as intelligible on the electric guitar (and non-existent on guitar synthesizer parts). With the Creek, these shadings come to life on the electric and synthesized guitar parts, bringing new layers of depth to the music. Low-level resolution of a component is dependent upon its noise floor. The Yamaha/Grado combo generates a slight hum, as Grados sometimes do with certain turntables. This hum isnt apparent when records are being played, but its a given that it does cloud some of the low-level details. Despite this handicap in my system, the Creek brought a treasure trove of information out of my old records. During a section of the "Witches Dance" from Symphonie Fantastique (yes, I love this record), the bows are bounced on the strings of the violins to produce a chilling effect. The odd intonations produced by this percussive technique are never lost among the swirling woodwinds as the orchestra starts to build to a climax. More than once has this music raised some hairs on the back of my neck! All components have a character to their noise, and the OBH-8 is no different. The Creek overlays a fine grain that is first evident in the midrange and becomes slightly coarser in the upper octaves. High-hats, triangles, and bells are infused with this slight (and I do mean slight) grain. This grain is the only thing that lets you know that this device is solid-state and not tube. The Rega/Creek combo gave me the best soundstage and dimensionality Ive ever heard with my system. Vocals and instruments had a palpable weight and feel to them. Unfortunately, I didnt have the Rega long enough to give it real a evaluation. The Yamaha/Creek combination does a good job of locating the instruments in the soundstage; it just doesnt infuse the spaces between the instruments with "air" to give that smooth continuous soundfield. Because I did observe this "air" with the Rega, I know that its something that the Creek can do, given the right turntable. Its not as if Im fretting about the system I have now. With some of the panoramic RCAs, I can get a soundstage that extends about one and a half feet beyond each speaker, with a depth of up to five feet. While some may claim that placing instruments in a soundstage is an audio trick, sometimes it can add meaning to a piece of music. Lets go back to Symphonie Fantastique and the movement entitled "A Scene from the Fields." This movement opens with an oboe playing a simple shepherds tune in the back-right corner of the orchestra. This is answered by flute in the back and left of center. These two voices volley the melody back and forth until they come together as a duet. Each instrument is clearly delineated throughout this exchange, never blurring or losing focus. The melody is then picked up by the first violins, in front and to the left, and the plucked basses, mid-stage and to the right. Then the second violins start in behind the first violins with a counter melody. Its these kinds of revealing moments that keep me up late at night listening to the music. My limited experience with separate phono preamps precludes me from making any direct comparisons to the Creek OBH-8. Ive spent some time listening to Audio Researchs PH3, but at $1495, its not fair to make a comparison. SoundStage! has reviewed quite a few phono stages across a broad price range. The DB Systems DB-8HG (see Greg Weavers review) is priced at $175, which is very close in price to the OBH-8. 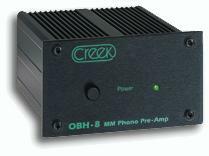 Creek does make an upgraded version of the OBH-8 called the OBH-8SE. This upgraded version sports two J-FETs, gold-plated connectors, and the upgraded power supply for an additional $130. Creek products are widely distributed, so its likely that one of your local dealerships carries the OBH-8. As always, the most important factor is what products you can take home to demo in your system. Its only then that you find out which works best for you. If you want to enter into the world of high-end vinyl playback, the Creek OBH-8 is a great place to start. Its ability to make my old turntable and records sound dazzling makes me wonder what is possible with a real high-end turntable. I have to admit that the Creek OBH-8 has exceeded my expectations. I certainly have no itch to replace it anytime soon. The best testimonial I can give is that I listen to my records more now than I have in over ten years. With the OBH-8 in place, I now consider my analog playback combination the superior front-end in my system. "Perfect sound forever," eat your heart out!